Why Is Maryland Called the “Old Line State”? You may think it refers to the most well-known line in Maryland, the Mason-Dixon Line, which forms the northern and eastern border of the state. That would make sense: It was surveyed in the 1760s and draws deeply on early Maryland history. Maryland is called the Old Line State to honor the heroic fighting of a Maryland regiment, or line, in the American Revolution. George Washington was an early source of reference to the “old line” that protected his retreat from the Battle of Long Island. The ties between the “old line” and the State of Maryland grew gradually throughout the 1800s and early 1900s. 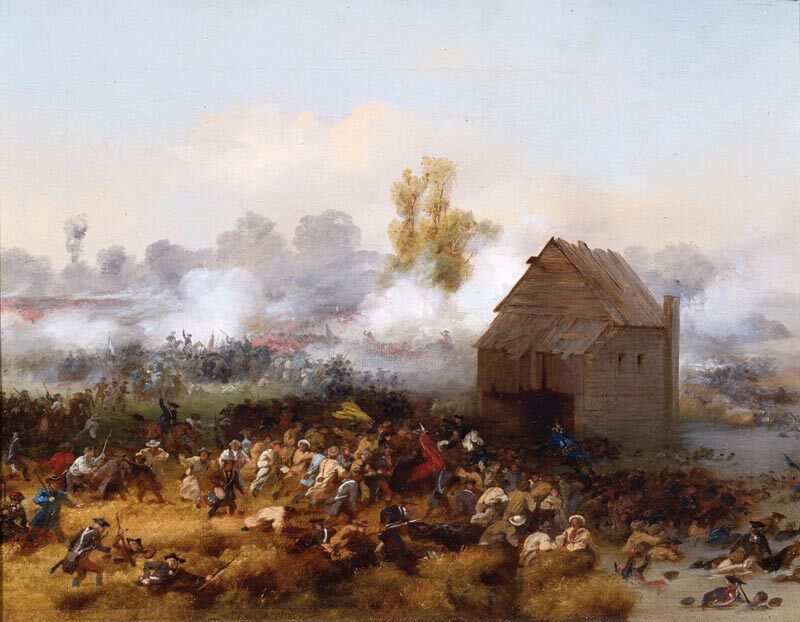 The Battle of Long Island (also called the Battle of Brooklyn or the Battle of Brooklyn Heights) was, at the time, the largest battle ever fought in North America. The initial British arrival in the rebelling colonies had occurred in Boston in April 1775, immortalized by Paul Revere’s ride. American forces subsequently laid siege to Boston (the famous Battle of Bunker Hill occurred early in the siege), and drove the British into retreat to Halifax, Nova Scotia, in March 1776 to await reinforcements. For the revolutionaries, however, it was only a temporary reprieve. They knew the next target likely would be New York City, which had greater strategic importance for the British. By April, Continental Army Commander-in-Chief George Washington had arrived in New York City to oversee fortification of the area. Because the British had clear control of the seas, neither Washington nor his officers expected the fortifications to repulse a British attack for long. They could, however, make the British invasion more costly, in time, supplies, and men. For the more than 10,000 Continental Army troops stationed there, it was a waiting game: No one knew exactly when the British would attack. In June, Washington received word that the British had left Nova Scotia and were heading toward New York. By the end of that month, some 130 British ships had anchored off Staten Island. News of the Continental Congress’s approval of the Declaration of Independence reached New York in early July. Meanwhile, British ships maneuvered to cut supply lines to Continental Army outposts on Long Island. Washington was offered and refused an opportunity to surrender. Under the command of General William Howe, the British forces numbered nearly 40,000 by August, with roughly 400 ships anchored in the waters around New York City. Discipline among the Continental Army regiments was a primary challenge for Washington and his commanders. Many recruits lacked basic training or supplies. Maryland’s regiment, which had only joined the Continental Army in August, was an exception. Washington divided his army between Long Island and Manhattan, believing that an initial assault on Long Island may be a diversion for a larger attack on Manhattan. The British sent an advance force of roughly 4,000 soldiers to Long Island on August 22. When Washington was notified of their arrival, he wrongly assumed that their presence confirmed his suspicion of a diversionary tactic, in part because he had been told the advance force numbered double its actual presence. British troops continued to arrive in subsequent days, bringing their total force on Long Island to roughly 20,000. Finally, on the night of August 26, British troops began their move inland to confront the waiting, and vastly outnumbered, Continental Army. At 11 o’clock that night, Continental Army soldiers fired the first shots of the Battle of Long Island after spotting two British soldiers rummaging through a watermelon patch. The Maryland and Delaware regiments, part of a brigade commanded by General William Alexander (Lord Stirling), were defending Gowanus Road, one of several paths to cross Long Island toward Manhattan. Fierce fighting ensued, but the ultimate result was not in doubt—the British were simply too many. Lord Stirling ordered a retreat by all his forces, except for the Maryland regiment. These remaining soldiers, often known as the “Maryland 400,” actually numbered roughly 270. 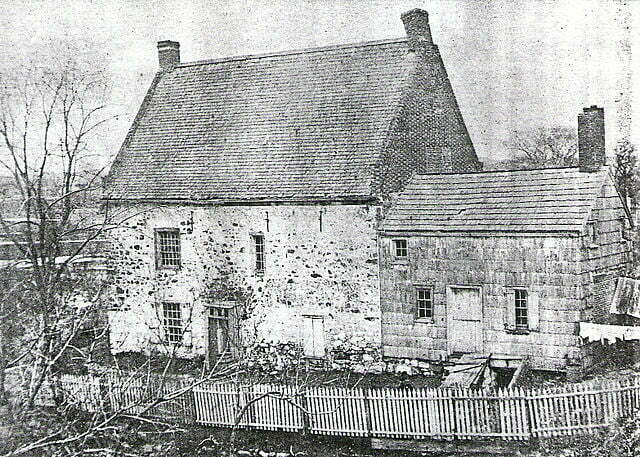 Staying behind, they launched multiple attacks on the 2,000 British soldiers positioned at the Vechte-Cortelyou House. These attacks allowed some 1,600 of Stirling’s men to retreat safely, the start of broader retreat of all Continental Army forces from Long Island to Manhattan. Of the 270 Marylanders fighting, only a dozen made it back to the American lines. Most were killed; roughly 100 were captured. The Continental Army’s successful retreat from Long Island (aided by Howe’s controversial decision to begin a siege rather than press on with the campaign) was hailed as a pivotal moment in the American Revolution. Had the retreat failed, the bulk of the Continental Army may have been killed or captured, ending the American rebellion just weeks after the Declaration of Independence. Washington is credited with some of the earliest references to the Maryland regiment as the “old line.” Washington referred to all regiments as a “line,” and the rationale behind naming the Maryland regiment the “old line” is somewhat unclear. It likely refers to their comparative discipline and experience—visible prior to the Battle of Long Island and proven during their cover of the Continental Army’s retreat. Surviving members of the first Maryland regiment reinforced Washington’s perception, opposing the appointment of new officers from outside their ranks in 1780. They claimed status as an “Old Regiment” whose reputation warranted internal promotion. Six months after the Revolutionary War ended in January 1781, Washington was still nostalgic for the lines of Maryland, Delaware, and Pennsylvania—those “old lines thrown up in 1776″—that played a central role in securing the escape to Manhattan. Maryland’s Revolutionary War veterans deepened the connection between the phrase “old line” and the Maryland regiment that covered Washington’s retreat. As time moved forward, their contributions became part of the broader narrative of the state, with their achievements a source of pride for all Marylanders, not just those who charged British troops at Vechte-Cortelyou House. Still, there is no record of Washington referring to Maryland as the “Old Line State.” Some historians note that any preferential reference to a state likely would have been avoided—as president of a still-tenuous federation, Washington sought to allay fears of state favoritism. Even early histories of Maryland fail to use Old Line State as a nickname, and no single source claims ownership of the term. In fact, nineteenth-century historians and scholars of Maryland omitted references to the “Old Line,” with its first appearances coming in popular songs and poetry. Those sentiments were codified in the twentieth century, when histories in the 1920–30s used Old Line State as a stand-in for Maryland. The Maryland Manual Supplement, published in 1975–76, was the first to state the connection explicitly, noting Old Line State as a nickname for Maryland. Perhaps because the moniker was already part of popular culture, it made no attempt to trace its origins. A monument in Prospect Park honors the Maryland 400, who are believed to be buried in a mass grave nearby on Third Avenue between 8th and 9th Streets. Multiple attempts by archaeologists to find the grave have failed. 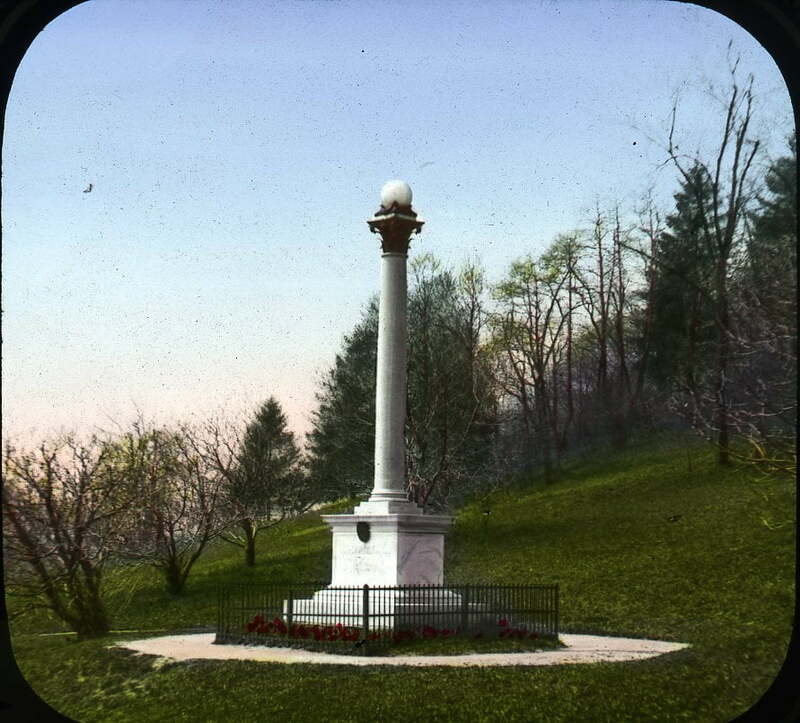 The monument, a 12-foot Corinthian column made from Maryland granite and topped with an orb, was donated by the Maryland Society of the Sons of the American Revolution and unveiled on August 27, 1895, 119 years after the original battle. Built at a cost of $3,000, it was restored in 1935–36 as part of the Works Progress Administration, a New Deal program. Additional repair and restoration took place in 1969, 1991, and 2008. When hundreds of Marylanders sacrificed their lives at the Battle of Long Island, the outcome of the American Revolution was far from certain. It was the first battle since the Declaration of Independence, and a stark reminder of the military power of the British Empire. Today, it is a reminder of the potential power of a vision for society, and a willingness to fight to realize that vision. The sacrifices of Maryland’s soldiers at the Battle of Long Island are now immortalized in a name—the Old Line State—that has come to represent the aspirations of successive generations in a state of 6 million and a nation of many millions more.